AMMONNEWS - Groups of Israeli extremist settlers early Sunday stormed al-Aqsa Mosque/ Haram al-Sharif compound in the occupied city of Jerusalem, an official Palestinian source confirmed. The General Director of the Islamic Awqaf and al-Aqsa Affairs, Sheikh Azzam al-Khatib, told Petra's reporter in Ramallah that the settlers stormed the compound under the protection of Israeli police. Al Khatib said 80 settlers broke into the compound in two separate groups earlier today and took provocative tours inside it. 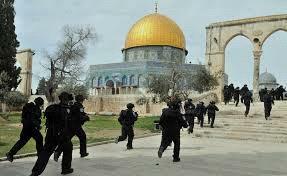 The holy mosque is subject to daily violations and break-ins by Jewish settlers. Israeli police deliberately arrest and harass workers in the Department of the Islamic Awqaf and al-Aqsa Affairs to prevent them from confronting the settlers' attempts to storm the holy mosque and perform Talmudic rituals.